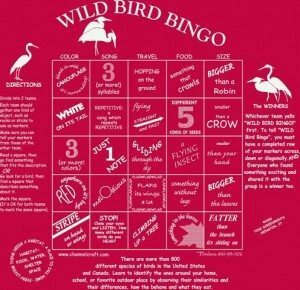 NOTE: Check out our more recent post on Holiday Gifts for Birders, 2015! Looking for kids’ gifts? We also have a post on Great Bird Books for Kids. Hard as it may be for some of us to imagine, the Audubon Christmas Bird Count isn’t the only big event in December. There’s that little holiday called, um, Christmas. Plus Chanukah, and Kwanzaa, and solstice… lots of reasons to celebrate and buy gifts for loved ones. Need help finding gifts for the birders in your life? Here are some ideas for cool presents for adults and kids, home and field, in various price ranges. Fingerless gloves can make it easier to handle binoculars and scopes in cold weather. Bike gloves are one option that can cost as little as $20. Or you can get fingerless gloves designed specifically for outdoor optics and photography such as a waterproof, insulated pair for $49.99 from Aquatech. Backpacks or belt packs. The FieldStation Beltpack by LowePro has a padded compartment for binoculars and a retractable platform for reading a field guide or writing in a journal, as well as a water bottle pouch. It’s $99.99. Other LowePro backpacks are built to hold scopes and tripods. BirdCam. Catch images or video of feathered backyard visitors even when you’re not home! Wingscapes sells a motion-detecting birdcam that is endorsed by the National Audubon Society for $119.95. Nest boxes. If you’re in the Bay Area, consider gifting one of the wooden nest boxes made by our volunteers! Prices are $20 and up, with all proceeds going to our conservation and Eco-Education programs. Call us at (510) 843-2222 to reserve one. Drawing birds kit. GGAS board member John Muir “Jack” Laws recently published a wonderful book on how to draw birds. Pair that book with a set of colored drawing pencils and… voila! a great gift set that will open up a new and fun approach to seeing birds. The Laws Guide to Drawing Birds costs $24.95 and colored pencils are available at any art or stationery store. BirdProject Soaps makes organic, fair-trade soap that contains a little ceramic bird figurine inside each bar. Owner Melissa Mayntz was inspired to start the business by the BP oil spill off the Gulf Coast, and donates half the proceeds to wildlife rescue. Available online for $24 and up. Night Light. There are a lot of bird-shaped night lights, but this Wren Night Light from recycled glass stands out with its craftsy look. It’s $39.99 from the National Wildlife Federation, which has an extensive online store of nature gifts. Bird Bottle. Also from the NWF is this Goldfinch Bottle with stopper, useful for holding olive oil or vinegar. Currently on sale for just $9.97. Shade-grown coffee provides habitat for birds as well as that essential morning boost for humans. National Audubon is selling shade-grown coffee that is organic, certified as sustainable by the Rainforest Alliance and grown on farms that take good care of their workers. Order one shipment ($10.49 for a pound) or buy a gift membership in their Coffee Club, which will provide recurring shipments at an interval of your choice. 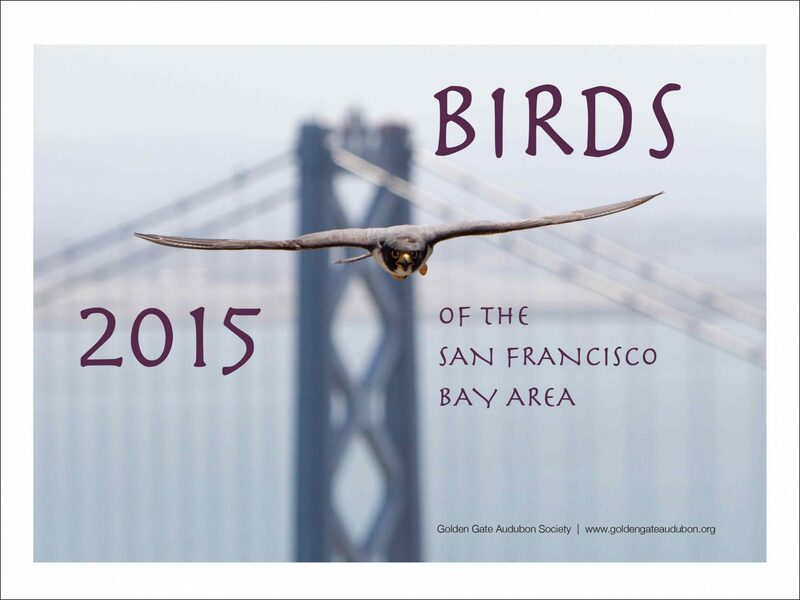 2015 Birds of the SF Bay Area Calendar. You knew we couldn’t make it through a holiday gift post without plugging our gorgeous photo calendar, right? It’s $20, and all proceeds benefit Golden Gate Audubon programs. Mugs. Tacky or profound? You be the judge, with the “Advice from a Hawk” mug for $12.95 from the NWF store. It advises: Soar to new heights. Be a keen observer… Find a field that suits you. Etc. Similar mugs for owls and eagles. 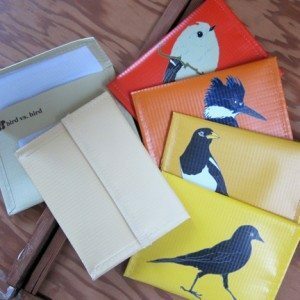 Bird coin purses handmade in Oakland from scrap materials by lifelong birder Bess Petty. Bess also makes magnets, pins, tote bags and vinyl stickers that can be used to personalize water bottles, bike helmets etc. Coin purses are $8.50, and a pack of 12 vinyl stickers is $4 at her Bird Versus Bird web site. Window decals can help prevent bird collisions. Various companies sell silhouettes of hawks, hummingbirds, spider webs, snowflakes, cats or more, for as little as three decals for $4.95. Vintage bird gift tags will come in handy when wrapping all your other birdy gifts. 36 tags for $12. Bird earrings made from repurposed bike inner tubes by Michelle Luo, of Pearl Reef Designs in Berkeley. She gets the tires from a local bike shop, and each pair of earrings (about $15) is different. And wow! — Michelle is offering a 25% discount and free shipping to Golden Gate Audubon members! Use the coupon code “goldengateaudubon” when you order online. Some other Etsy finds: Bird-on-wire photo pendant on glass tile for $14 by Nathan Trivette from Portland, Oregon. A colorful pelican pendant on fused dichroic glass for $28 from an Illinois artist. Or an owl necklace in black enamel over stainless steel, from a Seattle artist for $23. Caveat: The upside of Etsy — that these are one-of-a-kind products by individual artisans — can also be its downside. Quantities may be limited, and they may be sold out of the exact item you want. Feather pin in sterling silver with 18k gold accents. Pin is $24 from Environment for the Americas, sponsor of International Migratory Bird Day. There are matching earrings too. Audubon print pendants. Maine craftswoman Ruth Wales embosses tiny versions of James J. Audubon’s bird prints in resin and hangs them from silver chains. $24-26. Pellet science. Doesn’t every ten-year-old want an Owl Puke Kit? This science kit provides kids with a sanitized owl pellet to cut open. They’ll find bones that tell them what the owl had for dinner. From the NWF store for $19.99. Bird Legos. New in 2014, Lego has come out with bird kits! Make a hummingbird, jay or robin. Nice change from all those Star Wars figures. 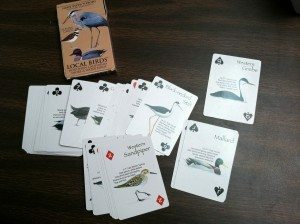 Bird playing cards. This deck of cards has really lovely bird photos — a different Northern California bird on the number side of every card — yet is also usable for regular card games such as crazy eights, poker etc. Great for adults as well as kids. There’s a shorebird deck as well as a deck with yard/trail birds. The manufacturer is a community-oriented firm that has supported conservationists defending S.F. Bay wetlands against development in Redwood City. Bird feeder kit. Okay, I promised no bird feeders in this article, but this is a build-it-yourself kit for kids that comes with stickers and a plush Cardinal. From NWF for $19.97. 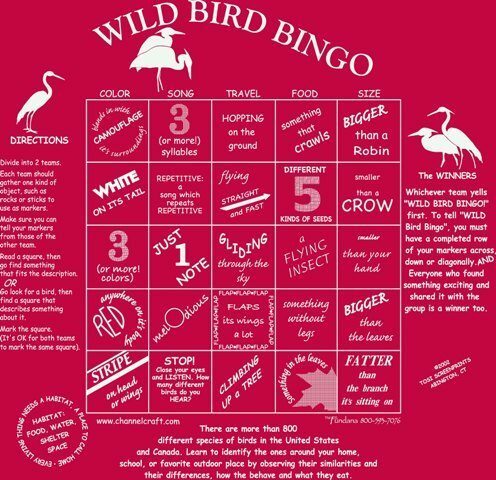 Wild Bird Bingo Bandana. You can wear this cotton bandana, or use it to play Wild Bird Bingo while on a hike! Match each square with a bird that is “fatter than the branch its sitting on,” or “bigger than a robin,” etc. It’s $7 from Fundana Bandanas. You can also purchase a Raptor Identification bandana with images of 18 raptors in flight for $8 from Environment for the Americas. Bird Brainteasers. This book doesn’t test birding knowledge, but it has crossword puzzles, Sudokus etc. with a bird theme. Good to keep young minds occupied on long holiday trips. $9.95. Bird Pipe Cleaner Kit. Just right for a little stocking stuffer, this $3.95 kit provides 36 colored pipe cleaners and directions for turning them into a bird. Jigsaw puzzles. Buffalo Games produces a number of bird jigsaw puzzles, including five that are endorsed by National Audubon and cost $10.95. Migration map. This National Geographic poster showing migration routes of 67 species across the Americas would look good in either a kid’s bedroom or an adult’s office. It’s $10.95 or $19.95 for a laminated version. Books, books and more books. The Cornell Lab of Ornithology has an extensive online store of kids’ bird and nature books, including their Top 100 Sellers. They also list books targeted at different age groups. Want more bird-buying opportunities? Organizations like National Audubon Society, National Wildlife Federation, and Environment for the Americas have many more items in their online stores. And Birdorable.com is a company that makes clothing, mugs, clocks etc. with images of “cute-ified” birds — roly-poly plovers with huge eyes etc. Not for everyone, but if you like cartoony-cute, check it out. Finally, don’t forget that you can donate to conservation groups like Golden Gate Audubon Society in honor of your loved ones — a holiday gift that may mean more to them than yet another mug or necklace. Do you have other bird gift ideas to share? We’d love to hear about them. Add your comments in the comment section below or at https://goldengateaudubon.org/blog-posts/holiday-gifts-for-birders/. Happy holidays!